Formulated for cats experiencing food sensitivities, BLUE HF Hydrolyzed for Food Intolerance helps minimize the chance of adverse reactions to common proteins. 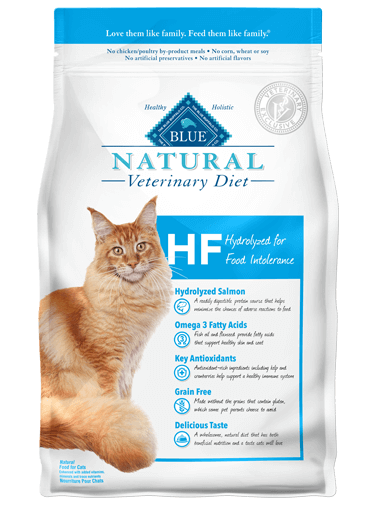 BLUE HF is available exclusively through veterinarians and is made with the natural ingredients BLUE is known for. Hydrolyzed Salmon- A readily digestible protein source that helps minimize the chances of adverse reactions to food. Omega 3 Fatty Acids - Salmon hydrolosate and flaxseed provide fatty acids that support healthy skin and coat. Key Antioxidants - Contains vitamins E and C, plus antioxidant-rich ingredients including blueberries and cranberries to support a healthy immune system. Grain-Free - Made without the grains many pet parents choose to avoid. Delicious Taste - A wholesome, natural diet that has both beneficial nutrition and a taste cats will love. Salmon Hydrolysate (source of Omega 3 Fatty Acids), Peas, Potatoes, Pea Starch, Pea Protein, Canola Oil (source of Omega 6 Fatty Acids), Flaxseed (source of Omega 3 and 6 Fatty Acids), Natural Flavor, Pea Fiber, Calcium Carbonate, Pumpkin, Dried Kelp, Dehydrated Alfalfa Meal, DL-Methionine, Choline Chloride, Dried Chicory Root, Potato Starch, Caramel Color, Salt, Vitamin E Supplement, L-Threonine, Mixed Tocopherols (a natural preservative), Iron Amino Acid Chelate, Zinc Amino Acid Chelate, L-Ascorbyl-2-Polyphosphate (source of Vitamin C), L-Tryptophan, Parsley, Blueberries, Cranberries, Barley Grass, Yucca Schidigera Extract, Turmeric, Nicotinic Acid (Vitamin B3), Copper Amino Acid Chelate, Oil of Rosemary, L-Carnitine, L-Lysine, Manganese Amino Acid Chelate, Thiamine Mononitrate (Vitamin B1), Taurine, Biotin (Vitamin B7), Vitamin A Supplement, Pyridoxine Hydrochloride (Vitamin B6), Calcium Pantothenate (Vitamin B5), Riboflavin (Vitamin B2), Ferrous Sulfate, Zinc Sulfate, Vitamin D3 Supplement, Vitamin B12 Supplement, Folic Acid (Vitamin B9), Copper Sulfate, Dried Yeast, Dried Enterococcus faecium fermentation product, Dried Lactobacillus acidophilus fermentation product, Copper Amino Acid Chelate, Dried Aspergillus niger fermentation extract, Dried Trichoderma longibrachiatum fermentation extract, Dried Bacillus subtilis fermentation extract, Manganese Sulfate, Calcium Iodate, Sodium Selenite.